Wintermann 200 Pro is designed for use in all applications which require minimum power consumption, low weight, and mobility of equipment. With the optional power switch, the machine can be powered not only from a three-phase grid connection, but also from single-phase connection or medium-sized power generator. Despite its small size, the spray system can be used on a construction site and for insulating existing buildings (both for indoor and outdoor applications). Wintermann 200 Pro is manufactured and intended for use at small and medium-sized companies. It does not require an expensive screw compressor or a massive power generator. Attractive price, state-of-the-art design and low power consumption are the key strengths of Wintermann 200 Pro. Despite its compact design, the machine successfully sprays the majority of commercially available closed and open-cell foams. 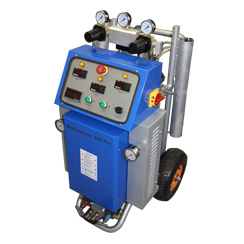 The technical solutions used in Wintermann 200 Pro ensure easy spraying of polyurethane. TBH Polska Sp. z o.o. is the exclusive distributor and service provider for the Wintermann brand in Europe. In accordance with our company policy, we offer a broad range of training as well as warranty and post-warranty service for the Wintermann brand in Europe. Our company is a manufacturer of various CNC and spraying machines. The Wintermann Raptor IV Gun, recirculation and parking systems and other components are also designed and manufac tured by us. We can design and manufacture equipment for special use or operating according to customers design. We provide the opportunity to lease or buy equipment on credit, as we cooperate with many renowned leasing companies. - Air supply: 5 to 8 bar (0.8 MPa) ~ 1 m3 / min.